Bridging The ISF-TMF Divide:What Roles Should Sponsors & Investigators Play? Regulation, more than just stipulating what must be done, must also define whose job it is to complete the task. The assignment of responsibility within the regulatory framework surrounding the clinical trial is essential to protecting the well-being of subjects and the validity of the trial’s data. Clear demarcation of the primary roles of sponsor and investigator and their associated responsibilities ensures that those conducting a trial are qualified and enables regulators to hold individuals and industry accountable to the high standards of ethical research. The growing trend of negative findings suggests systematic dysfunction in the relationship between the sponsor’s TMF and the ISF. As regulatory expectations increase, the ISF continues to represent a poorly controlled and growing risk for both sponsor and investigator, and a solution is desperately needed. At first glance, it might appear that the same strategies that have given rise to the modern sponsor TMF could be applied: specifically, the use of electronic TMF (eTMF) technology and the expanded integration of clinical systems. Unfortunately, the paradigm shift of the eTMF has failed to reach the ISF for a variety of regulatory and nonregulatory reasons. The path toward a modernized ISF is unclear, but it has become increasingly apparent that progress can only be made after fully reflecting on the complex interplay of responsibility between the roles of sponsor and investigator. When the sponsor TMF (hereafter called the TMF) and the ISF come together, they form the complete TMF. As one TMF, the ISF and TMF should be united in a dialogue, where each party both speaks and listens, and the clear story of the clinical trial shines through. Creating this crucial dialogue, however, is immediately disadvantaged by a cardinal difference between TMF and ISF: the TMF and ISF speak different languages. The “language” of the TMF is the structure of the reference model; this taxonomy of documents assigns every document a zone, section, and artifact, easily enabling consistent filing across a study. The reference model also applies a standardized system of metadata, ensuring that documents can easily be compared, moved, and grouped based on their attributes. The ISF, however, has no such standardized language, is unique to each trial site, and can vary significantly between protocols at the site level. Completeness: Without a one-to-one correlation between the zones of the reference model and components of the ISF, it can be difficult to determine what documents must be collected (whether filed in the ISF, TMF, both locations, or not at all). Contemporaneousness: Without buy-in from the trial site, the sponsor of a trial may have to depend on clinical research associates (CRAs) to collect documents at oftentimes infrequent site visits. Delays between collection and filing in the TMF often permit more egregious compliance issues to develop. Duplication: Lack of contemporaneous filing and the physical separation between ISF and TMF create the ideal conditions for duplicates to proliferate. Document Quality: Regardless of format, document quality can degrade in the transmission from site to TMF. Furthermore, poor GDP (good document practices) at the site can create an unending cycle of rework, if documents need to be recollected. Version Control: Keeping track of document versions can be a monumental task, especially when centrally produced documents incorporate site-specific changes. Metadata: The eISF system might apply and store metadata in a different way than the eTMF system does. This means that documents cannot be moved between systems without significant manual intervention. Technology: Even if the eISF system does not require on-site hardware (because it is cloud-based), a site may not have the basic document handling technology (like a stable internet connection or scanner) necessary to efficiently utilize the system. Expertise: Technical literacy at trial sites is variable. Site staff will require training and sites’ SOPs (standard operating procedures) and workflows will require updating to embrace an eISF solution. Economy: Will the sponsor or site pay for the eISF? Sites will expect reimbursement for the costs associated with any sponsor-mandated system. Security: The greater access afforded by an eISF is balanced with a greater need for access control. Electronic systems require significantly more complex security measures compared to physical documents. Because of these challenges, most ISFs remain in paper format. Investigators, already overwhelmed by the many logins and systems incorporated into their protocols, are unwilling to invest the time to learn another system. Study coordinators prefer the flexibility of paper documents and fear micromanagement of their files if constantly available to the sponsor for review. Sponsors are reluctant to adopt eISF technology in fear of investigator pushback and the unlikelihood of a positive return on investment. Although some technological solutions aim to bridge the gap between ISF and TMF, the ISF and TMF continue to speak different languages. The reason for this continued divide, however, isn’t just a lack of the right technology or the differences between the clinic and office — the divide is intentional and a product of the fundamental regulatory roles of sponsor and investigator. Identification Lists and Consent Forms: Unless specific permission is obtained from subjects, the sponsor should not collect identifying information. Furthermore, in most circumstances, collecting and storing identifying information is not in the best interest of the sponsor. Collection of patient information increases the regulatory load on the trial, necessitating compliance with HIPAA legislation in the U.S., General Data Protection Regulation provisions in the EU, and other regional privacy regulations. Case Report Forms and Source Documents: Source documents and CRFs, as the “primary source” of the trial’s data, must be given special care to ensure their accuracy. According to the MHRA, ownership of these primary source documents is central to the investigator’s control and oversight of the trial. It is crucial that the investigator maintains this independent copy of the transcribed data to ensure the integrity of the data.5 Furthermore, the investigator and the investigator’s delegates should be free to exercise their clinical judgement without undue influence from the sponsor. The sponsor’s energy is directed toward management of the investigator and ensuring proper execution of the protocol. The investigator’s focus is the rights and well-being of the subjects. The way in which the goals of the investigator and sponsor are aligned produces a system of checks and balances for each role. While the sponsor may more heavily value efficiency and timeliness, the investigator ensures efficiency and timeliness do not compromise patient safety. While the investigator may occasionally stray from the protocol or neglect filing requirements, the sponsor is able to provide oversight to return the investigator to compliance. Ultimately, the divide between the ISF and TMF is maintained because its benefits outweigh the challenges of maintaining a parallel but separate ISF. Because of comments received after initial iterations, the TMF Reference Model has adapted to consider the structural and functional differences between the TMF and ISF. Although many believe the Reference Model does not account for the ISF, this is a common misconception. Columns N through Q of the existing model indicate whether a TMF article is a sponsor or investigator document. In January 2018, the TMF Reference Model Steering Committee joined with the Model Agreements & Guidelines International (MAGI) group to streamline the current structure of the Reference Model. From this collaboration, the work already conducted by MAGI will be fully integrated into the TMF Reference Model. Previous to their collaboration, MAGI produced a well-adopted standardized table of contents for site regulatory documents to assist with the difficulties in indexing documents in the Reference Model to the Sponsor TMF8,9. The collaboration of MAGI and the Steering Committee will enhance the overall industry goal of a single and consistent model for both sponsor and investigator TMFs. As the importance and complexity of the TMF continue to grow, however, it’s not clear that the current arrangement will remain beneficial or sustainable. As modern eTMF solutions continue to drive integration of systems across the clinical trial landscape, this desire for integration, while efficient and convenient, cannot (and should not) fully bridge the divide between TMF and ISF. 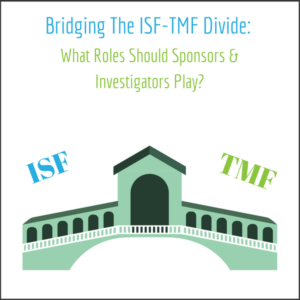 To be effective, future ISF solutions will need to reexamine the fundamental relationship between sponsor and investigator and cannot rely on imposing homogeneity as the strategy to overcome all challenges. Only by embracing the complex and varied differences between the roles of sponsor and investigator can harmony be restored. Thomas Cocciardi is a technical writer at LMK Clinical Research Consulting who is committed to expressing the human story behind each trial master file (TMF). In addition to technical writing, he also works as a TMF health specialist for a large CRO. Before specializing in the TMF, Cocciardi gained wide-ranging experience, both in and out of the pharmaceutical industry, working as a clinical research coordinator, preclinical data coordinator, intern medical writer, and intern brand writer. He holds an M.S. in regulatory affairs for drugs, biologics, and medical devices from Northeastern University.